When our family of 5 got a Costco membership earlier this month, we challenged ourselves: Can we really save money and eat healthy at Costco? Can we keep our food stamp budget and continue eating organic, non-gmo, whole grains, and plenty of fresh produce? Here is what we have learned so far. Week 3 of our #CheapHealthyCostco Challenge. Check week 1 here and week 2 here! By week 3 the magic has slightly worn off. Going to Costco is still fun (“Hello, free sample trucks at the end of every aisle. Yes, I would like to try your chicken salad on a cracker.”), but it is beginning to feel like a normal part of our routine. You can catch everything I share about this challenge on Facebook and Instagram with the hashtag #CheapHealthyCostco. Prices on the organic version of staple foods are almost unbeatable! 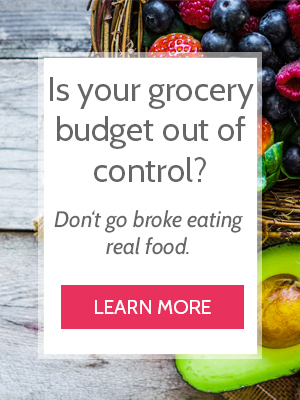 I don’t have to buy 10 bags of frozen veggies each week – just one huge one at a really low price. This cuts down on packaging (yay for the environment!). Shopping is extremely simple. We go in with a list, and we don’t just grab this little thing that’s $3 and not on the list – because everything at Costco is huge and at least $5-$10. Aldi can beat nearly all the prices for the non-organic staples. If you aren’t trying to buy organic, Aldi might be the better choice. I have to calculate groceries in $5 and $10 dollar amounts here. There is no going into Costco at the end of the month with $10 and seeing what we can buy. Which is fine, actually. I can go to plenty of other stores and do that. So that is probably less a con and more of just a fact. You MUST shop with blinders. Impulse purchases are so tempting here, and if you don’t have a very intentional budget amount, it would be easy to spend A LOT of money, all with the intention of saving money. This week, we decided to do a Costco Pantry Challenge. For 3 weeks we have shopped at Costco and stocked our pantry and freezer with bulk items – frozen vegetables, trash bag-sized tortilla chips, a 10-pound bag of organic carrots, etc. The last 10 days of August, we decided to see if we could avoid the grocery store until September. Did Costco give us enough staples that we could piece together decent, well-balanced meals? At the end of the challenge, I’ll post here and share exactly what we ate and which recipes we used. Is Costco Saving Us Money? At this point, I would say that Costco is not saving us money. We spent the same amoutn this month that we normally spend. But the only reason it isn’t is that we are eating better than we usually do. Costco prices mean we are eating more organic produce, organic chicken, and grass-fed dairy products than we normally eat. This is really good news for our food-stamp budget! Nearly 4 weeks in, I am still happy that we decided to try a Costco membership. I’m looking forward to the next month of #CheapHealthyCostco. Do you shop at Costco? What are your faovrite real food products? Let us know in the comments below! If you want to follow the #CheapHealthyCostco Challenge or our current Pantry challenge, follow us on Facebook or Instagram! We also share cheap, real food menu plans every month for FREE with our email subscribers. Get the next one here.